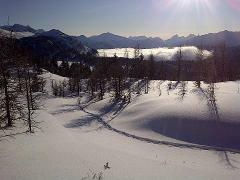 Take in breathtaking views of Rocky Mountain peaks as your professional snowshoe guide leads you through forests blanketed with snow and along shorelines of frozen lakes. Experience the premier guided snowshoe adventure in Canada at world famous Sunshine Village Ski Resort where the Gondola and a chairlift ride takes you straight to the land above the tree line! Go deep with us at Fortress Mountain this winter where our snowcat lift offers exclusive access to hidden terrain made famous in Hollywood blockbusters "The Revenant", "inception" and "The Bourne Legacy". 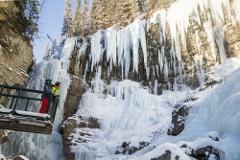 Explore the spectacular ice formations in Johnston Canyon with a professional guide. 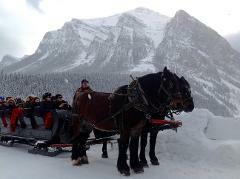 Transportation from Banff, Hot Chocolate and Cookies Provided. Make the most of your winter experience in the Rockies and enjoy a full day tour to Marble Canyon and Lake Louise with ample time on your own to partake in some truly Canadian winter experiences.